Uplighting on the palm trees creates a sense of drama and casts shadows across the landscape. “You can see the palm trees reflected in the water,” says Wilcoxson. Subtle downlighting is used on this structure to highlight the architecture. 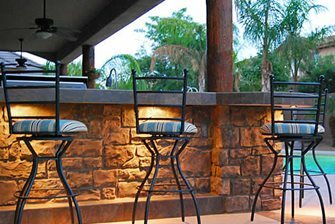 Pillars, columns, and stone veneer can all be lit to excellent effect. Crosslighting is when you light both sides of a focal point to eliminate shadows. Any tree with a strong character, colored bark, or other feature can be crosslit effectively. 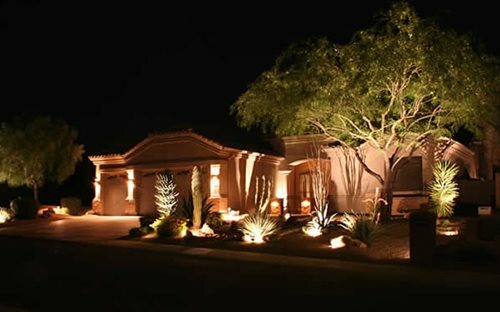 This example of crosslighting shows how one tree can light up an entire area of the garden. By using lights on both sides of the tree, you eliminate shadows and create a bold, bright effect. 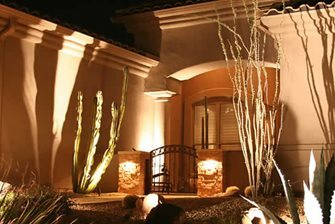 Uplighting plants with a stick-like or other bold form makes for a dramatic, sculptural entry. The lighting takes an attractive plant and turns it into a work of art. 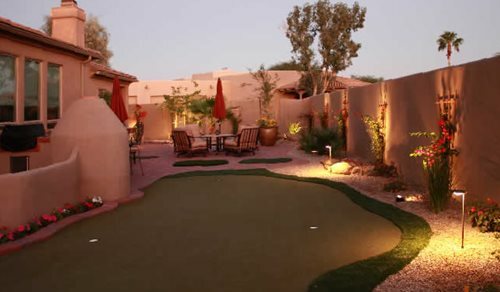 Pop-up lights in the putting green allow this homeowner to put when he arrives home after work. 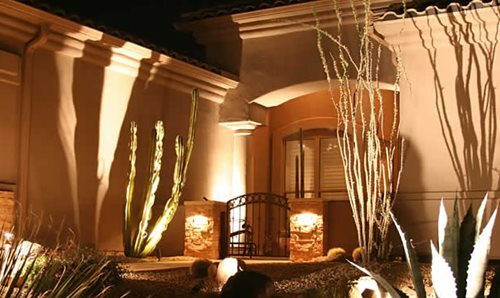 The design of outdoor lighting should always follow how the owners want to use the space. 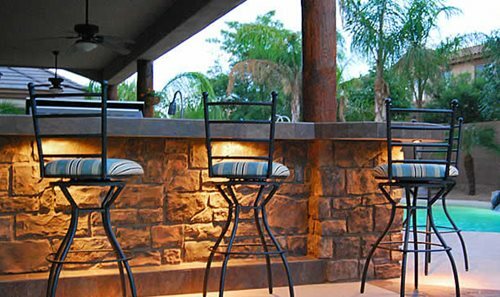 Downlighting stone veneer casts craggy shadows which give a sense of depth to this outdoor bar. 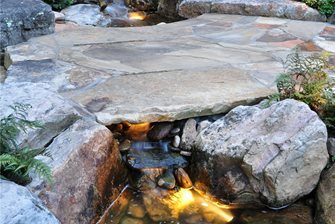 Underwater lights are set beneath the stones in this water feature to highlight the rippling water and craggy shadows of the stone. The pathway above even has slits in the stonework so as you walk over, you can see the light dancing on the water below. 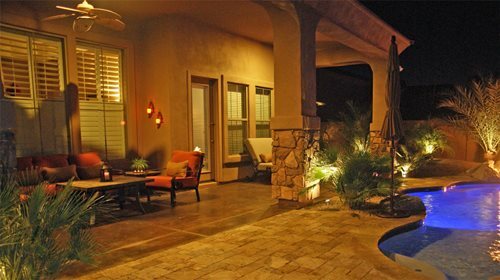 Two downlights set in the trees above cast ambient light onto the fire pit and make this a great spot for conversation and entertaining. Snyder chose to use downlighting instead of uplighting in this location, because there’s a gorgeous view beyond the trees. Uplighting would have created drama and detracted from the view beyond, while downlighting enhances the enjoyment of the view. 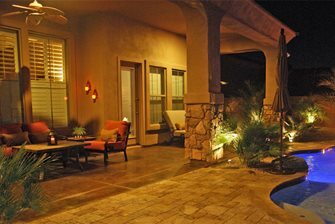 Designing your landscape lighting always starts by considering how you intend to use the space. 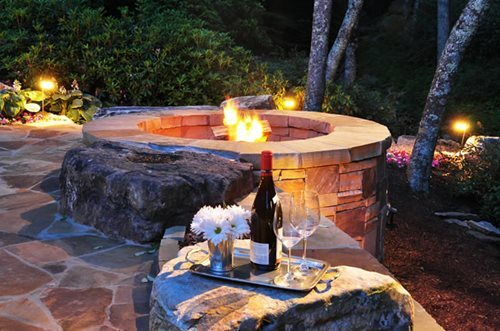 Do you like to entertain and need good lighting on pathways, patios and decks? Do the kids want to play soccer on the lawn after dusk? Or do you simply want to enjoy a beautiful view as you drive up to your home each evening? 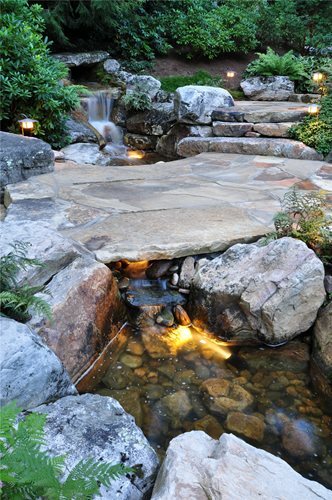 Here, landscape contractors share their pro tips for designing with lights. 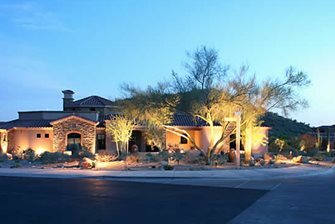 Sense of depth - “We use some lights along pathways, some on the house, and some within landscaped beds to provide a feeling of depth in the landscape,” says Matt Barton of Coppercreek Landscaping, Inc. in Mead, WA. 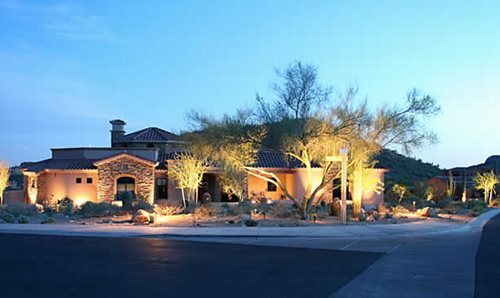 Ambient vs. spotlighting - Ambient lighting creates atmosphere by gently lighting an entire area, while spotlighting draws strong attention to a particular feature. “We use both broad and focused beams within the landscape,” says DuBreuil. Lighting strategiesThere are three main ways you can aim lights to get a particular result in the landscape. Uplighting is all about the drama of bold shadows and strong effects. By aiming the lights upwards into a tree or onto an architectural feature, you emphasize the contrast of dark shadows with bright light. Pathways are important both for safety and for beauty, but you don’t always need to use path lights right along the side. 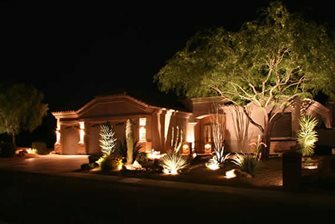 DuBreuil suggests mixing directional path lights with ambient lighting within the landscaped bed for a more natural look. 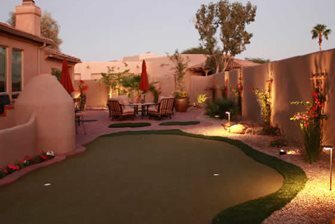 Patios are where we spend time with family and have conversations, so diffuse downlighting from above gets that moonlit effect without blinding people. Trees are an ideal candidate for uplighting or crosslighting. “When there’s a unique branch structure or colored bark, it makes an ideal focal point,” says Snyder. You can also create downlighting effects by placing lights within tree branches and aiming them downwards at a patio or garden bed. 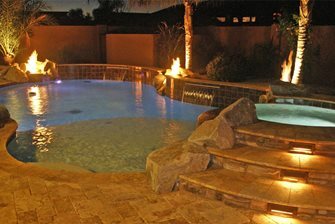 Water features can be lit as well. 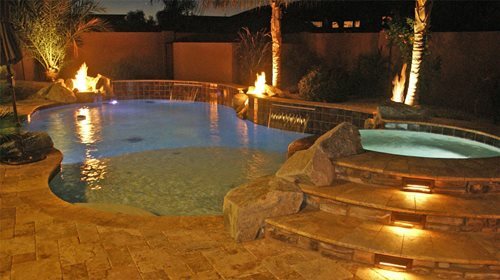 While we don’t think of electricity and water as natural partners, in fact many landscape lights are meant for underwater use. “We nestle lights in between rocks so you see the effect of the light without seeing the fixtures,” says Barton. Driveways don’t need a lot of lights, as most people using a driveway will have their headlights on. But you can beautify the journey to the home by lighting the landscape nearby. Special effects with lighting There are a lot of ways of playing with light and shadow to create special effects in the landscape. Dubreuil suggests filtering light downwards through the canopy of an oak, pine or maple tree to get a lacy shadow effect on the patio. Barton amplifies the effect of a focal point by using it to cast a dramatic shadow on the home. And Wilcoxson aims shadows from palm trees or fireplaces onto the rippling surface of a water feature. The effects you create will depend entirely on your own landscape and architecture.